Today I wanted to take a look at a great little multi tool gadget that is brilliant for the trail, especially longer multi-day treks and hikes. That tool is the the Victorinox Swiss Army Huntsman Pocket Knife. Many people are familiar with Swiss Army knives, they’re a classic and have been around a long time. However, if they’re new to you, you’re in for a treat as these bad boys are not only totally functional and practical, but they’re also pretty darn cool. What Exactly is a Swiss Army Knife? OK, this bit is for those of you who aren’t familiar with the concept of a Swiss army knife. If you are familiar, just skip on down below to then next section. Basically the concept of a Swiss Army knife is to have a load of handy little tools within one little pocket knife. Yes, you read that right, it’s small enough to fit in your pocket. It’s really about as simple as that. However, there is something nearly magical about the first time you get your hands on one. I say magical as I was a kid when I first played with my brothers one (Don’t tell my Mom 🙂 ). It was almost like a magic box of surprises as I pulled out each little tool and tried to figure out what it was for. Of course that was from my child perspective and so probably not quite the same for an adult. However, even as an adult I would bet that the first time you fiddle with a Swiss Army Knife, you can’t help but be struck with the ‘Wow, what a clever idea’ thought. What’s this about lots of Tools? OK, we touched on it above but now it’s time to get into the detail. What tools and functions does a Swiss Army Knife have? Well, first off it’s worth pointing out that there are different types of Swiss Army Knives. They use the same concept but will have a variation on the tool selection available. So, for example, every Swiss Army Knife will have a large knife blade as standard. The classic Swiss army knife has 5 (I think) additional functional tools, scissors, mail file, screwdriver flip, toothpick and tweezers. 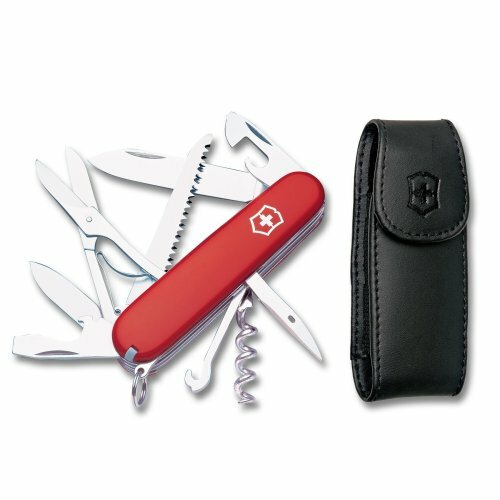 The Victorinox Swiss Army Huntsman pocket knife has 13 tools giving 15 functions. So you can see there is a lot of variation between different models. The general concept is still the same, lots of functionality in one neat little package. So with that in mind, let’s look at all the tools that are in the Huntsman. Are you ready? First up we have blades, one large and one small. These are standard knife blades, perfect for cutting a bit of tent cord or chunk of salami for your dinner. It’s handy to have the two sizes of knives although generally speaking, I mainly use the large one. Next we have 2 Philips (AKA a star) screwdrivers, one large and one small. While there are many different sizes of Philips head screwdrivers, it is handy to have a couple handy. You never know when you may need to unscrew something. This is a standard version rather than the Philips head. Again, always useful to have one handy as there will always come a time in the Great Outdoors when you’ll need it. For some reason, when I think of camping, I think of tinned food. However, I never take tinned food with me on a camping trip. I think that image must come from my child hood when the extensive outdoor food options that are available today weren’t available, so folks had to resort to good old fashioned tinned cans of food. Must have been heavy to carry. Anyway, I digress, the main point being there is a tin opener tool in the Huntsman should you need to wrestle a bean can open to get some much needed nourishment. Picture this, you’ve just finished a 6 months trek on the Appalachian Trail. I think a bottle of beer on the hills could be in order. No need to damage your teeth or fiddle with a lighter (There’s a knack to using a lighter to open a beer bottle) just rely on your trusty Huntsman and take out the Bottle Opener. Nice! I’ve put these two together as they are probably the two I use the least on my knife. A wire stripper will be very handy if you need to rewire a plug when out on the trail (I’m thinking more of a camper van type set up there as opposed to hiking or backpacking). A reamer is a small tool that is used to widen a drill hole. Useful should you need to make a hole in a piece of wood for some reason. This enables you to attach the knife to something, say a secure loop in your day pack. Again, if you’re out for a long hike and you happen to walk through some bushes with thorns. A pair of tweezers could come in very handy! I know I’ve done this MANY times and sometimes you need something to help you get the damned thorn out. Not something I use a lot but again, if you’re out for a longer multi day hike, anything extra that can help you with your dental hygiene can only be a good thing. Without doubt, one of the more regularly used tools on the knife. Scissors are one of those tools that regularly just make life that bit easier. The scissors are small enough so keep that in mind, they’re fine for smaller jobs though. I don’t carry a lot of parcels with me on the trail but I guess there are probably a multitude of uses for this in the Great Outdoors that I am not even aware of. Say lifting something hot, like a tin can, off a fire, fishing, pulling something like a thread through, etc. I’m sure there are many practical uses and my hunch is that one day I will be in such a need that this particular tool will come into its own for me and save the day. And finally, we have a wood saw. You’re not going to go cutting down trees with this saw, let’s get that clear, but for smaller jobs where you need to saw through something, this is the business. Wow, so how did you enjoy that little trip through the wonders of the Swiss Army Knife 🙂 The Victorinox Huntsman Swiss Army Pocket Knife is a practical, versatile and really functional tool for the trail. As you can see from the extensive list above, you get a lot of tools for your various needs. While not crucial for a day hike, I still pack mine away in my pack as it does come in handy from time to time. For longer multi day treks, its a must have for me. Aside from the trail, it’s just a handy little tool to have access too. Whether it be for a multitude of outdoor activities or for general day-to-day use, the Huntsman Swiss Army Knife is just a cool tool to have around and you great value for your money. My final comments are that I have been a happy use of the Huntsman for a long time now and I highly recommend it! Do you use the Huntsman or any other Swiss Army Knife? What are your thoughts on them? I’d love to hear about it in the comments below. Don’t leave it in your backpack. Take it on your car (screws to tighten) trips, fishing river or coast( guts out and clean), Visiting mother in law, she always needs a picture put up or screws put in wood(awl) or fixing a lamp switch ( screwdriver), Doing the yard edging ,mowing (unscrew the filter to clean it). Camp out bean pot the bail gets hot so use the hook to lift it. Chili and beans need a can opener. Visitor brings a bottle of wine from nearby winery- darn no screw off top ( cork screw work) . And the list goes on. Awesome! I couldn’t have said it better myself. The practical uses for the Swiss army knife are near endless … I don’t always leave it in my pack 🙂 I do use it a fair bit, always comes in handy for all sorts of tasks, especially when I go camping. You know, it just popped into my head there to check on it’s history. I know it came from the Swiss army of course but didn’t know too much more about it. Found this on Wikipedia … interesting. Seems the first ones where actually made in Germany back in the day. I have several of the Victorinox knives ( I don’t have any Wengers, I just have a thing about the Victorinox knives). I always have a classic in my pocket for the toothpick,tweezers, scissors etc.but my favourites are the Alex Farmer, the Soldier and of course the Huntsman. I’m a musician and the nail file and scissors on these tools has saved the day many times. They are pretty cool tools for sure. I am the same, can’t count how many times they’ve really got me out of a pickle too. I carry my Huntsman in my pack when I hike and I have used it on numerous occasions, especially when camping, for all manner of tasks. I’ve also used it round the house plenty of times too. They really are great and they’re so handy to carry around.